AudioRozza™ is a multipurpose audio recorder. Originally designed for radio broadcast monitoring, AudioRozza™ has evolved into a flexible solution for a variety of audio recording applications, providing three different recording modes, real-time audio compression, customisable embedded metadata and intuitive file storage layout. *Rozza - British English slang for the police. AudioRozza™ records an audio source is continuously in to manageable 1 hour long audio files. A seemless transition between recording to one file and the next means that no audio information is lost. Using an external trigger (such as a switch or relay), AudioRozza™ is triggered to record an audio source whenever the external trigger is activated. The External Trigger Recording mode makes it ideal for situations where you only want to record when a physical event takes occurs (e.g. : a fader, switch or relay is opened or closed). Radio stations have wired up their studio's mixing desk to trigger the External Trigger Recording only when the studio microphone is activated. This provides their DJs and announcers with a dialogue-only recording of their shows for them to analyse. With the Audio Level Recording mode, AudioRozza™ continuously monitors an audio source for a sound level that goes above (or below) a preset sound level threshold before audio recording is initiated. The recording will continue until the sound level goes below (or above) the preset sound level for a specified period of time. This mode is ideal for recording conversations or sound events which occur unpredictably. If the audio signal is not at the required recording level, AudioRozza™ has the ability to amplify or attenuate the incoming audio signal before it is written to the audio file. The AudioRozza™'s recording level meters provide a graphic representation of the incoming audio signal level as well as the post Gain Control level, ensuring that the audio source is being recorded at the correct level. AudioRozza™ by default stores the recorded audio in the uncompressed Waveform Audio file format (also known as WAV or WAVE), however AudioRozza™ also provides the ability to use third-party audio codecs to compress the recorded audio on-the-fly into a compressed audio format, such as the popular MP3 and Vorbis formats, and at the same time providing full control over the codec's compression settings. AudioRozza™ provides the facility to add customised metadata (data related to the audio recording) and automatically embed it into the recorded audio files. The metadata is stored within the audio file using popular metadata containers such as ID3 (ID3v1 and ID3v2) commonly used within MP3 audio files, as well as the INFO chunck of the RIFF (Resource Interchange File Format) used within WAV files. Most Digital Audio Workstations (DAWs), such as Adobe® Audition®, non-linear editing and media player software are capable of reading this metadata, suppling the sound editor with more detailed information about the recording. The start date and time of the recording (or a subset thereof). The end date and time of the recording (or a subset thereof). 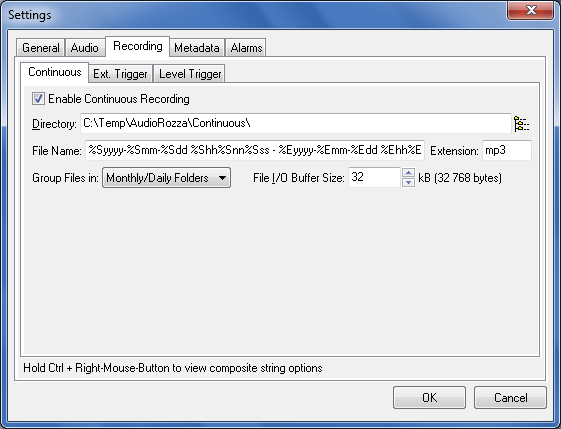 The audio codec used to convert the captured audio into a compress format. The name of the audio capture card used. The version number of the AudioRozza™ application used to perform the audio capture. AudioRozza™ provides a veriety of directory storage options as well customisable file naming conventions to allowing recorded audio files to be quickly and efficiently located or archived. AudioRozza™ can also be run as a Windows® Service. This means that AudioRozza™ can start running as a background process as soon as Windows® is loaded, allowing AudioRozza™ to record audio without first requiring a user to login to Windows®. Main AudioRozza™ Window in it's compact form, displaying recording status indication and providing access to general controls. 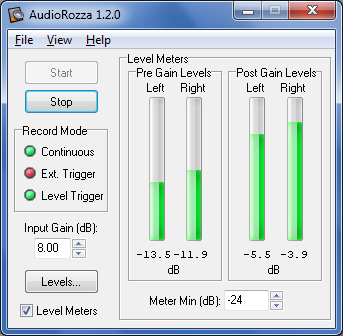 Main AudioRozza™ Window in it's expanded form, showing the pre- and post- gain audio recording levels, recording status indication and providing access to general controls. 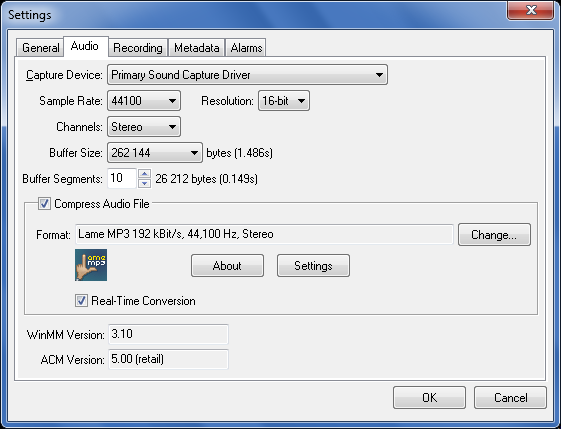 AudioRozza™ Audio Settings window, showing the audio cature card and compression settings. 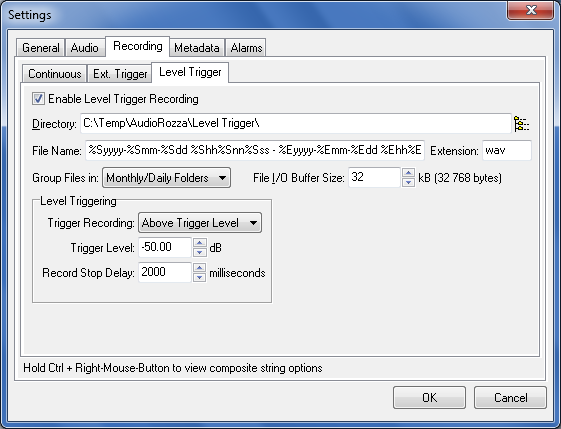 AudioRozza™ Recording Settings window, showing the Continuous recording mode configuration. 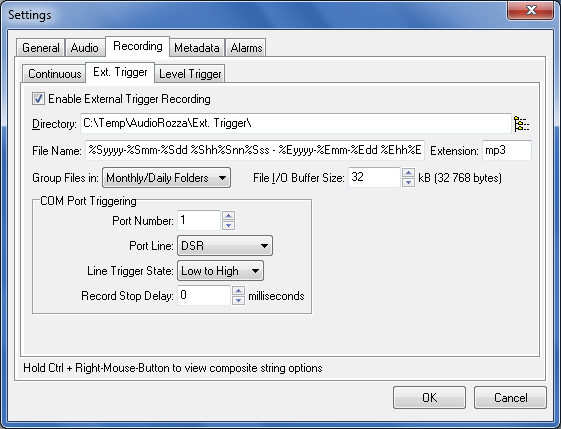 AudioRozza™ Recording Settings window, showing the External Trigger recording mode configuration. AudioRozza™ Recording Settings window, showing the Level Trigger recording mode configuration. 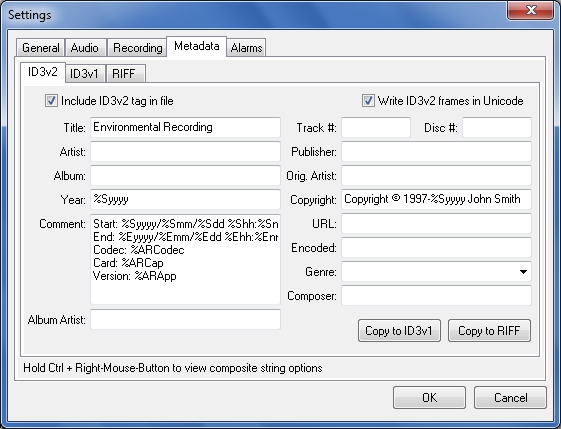 AudioRozza™ Metadata Settings window, showing the configuration settings for ID3v2 metadata. Storage Space: 10MB of available hard-disk space for installation; additional free space required during installation and for the storage of recorded audio files. (South Africa) AudioRozza™ is used to record Mix 93.8FM's radio station "Police Tapes" (a continous recording of the radio station broadcast, as required by the broadcasting authorities). Using AudioRozza™'s External trigger facility, Mix 93.8FM provides "Live Only" recordings (recording which are only made when the studio microphone is on) for its radio presenters to listen back to their announcemnets, interviews, discussions, listener call-ins and competitions. If you would like to try out AudioRozza™, a demo version is available from the Downloads Page.